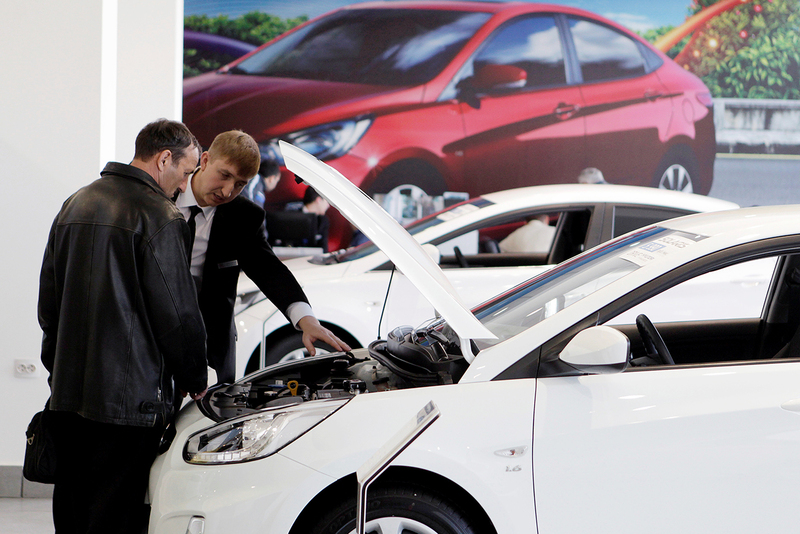 A customer listens to an employee near a Hyundai Solaris car at a showroom of a dealership in Stavropol, southern Russia. As Russia’s economic woes persist and prospects for the near future look feeble, major international car manufacturers that lack local production are leaving the Russian market. Among these are Germany's Opel, America's Chevrolet and Japan's Honda and Mitsubishi. In 2016, more than 270 car models were officially presented in Russia, which is a third less than in 2014. Before the onset of the economic crisis, there were 410 car models on sale in Russia, reported Gazeta.ru, citing the Autostat analytical agency. Due to the fall in sales, most car producers are removing cars in low demand and putting focus on those that are more affordable, said Azat Timerkhanov, director of Autostat's press office. The reduction in the variety of models shows that the Russian car market is entering a period of profound change, said Vladimir Bespalov, an analyst at VTB Capital. "When the crisis began, car dealers in Russia started to going bankrupt as sales plummeted and dealerships became unprofitable; consequently, many car models not produced locally and for which there was not big demand, began leaving Russia," said Bespalov. Honda's departure was one of the most significant events on Russia's car market since the crisis began. In 2015, Honda stopped centralized supplies to Russia of the Honda and Acura cars, as well as motorcycles, said Timerkhanov. Many brand dealerships were closed, and the remaining dealerships now import the cars directly and set the prices themselves. Besides Honda, dealerships owned by Japan's Mitsubishi, Germany's Opel and America's Chevrolet also suffered heavily. "Companies that don't have local production in Russia suffered greatly," said Timerkhanov. According to the European Business Association, in 2016 the Russian car market contracted by 12 percent, but this decline is at a much slower pace than in 2015 when the market declined by 36 percent. In January, it decreased by five percent and in February by four percent. "This gives us hope that the market will bottom out in 2017, and even start bouncing back," said Timerkhanov. There is positive news for Russia's economy, however. The rise in oil prices and the stronger ruble are creating favorable conditions for the Russian market’s rebound. "Pent up demand can be a big factor, and this concerns people who in the early stage of the crisis postponed buying a car until better times," said Timerkhanov.